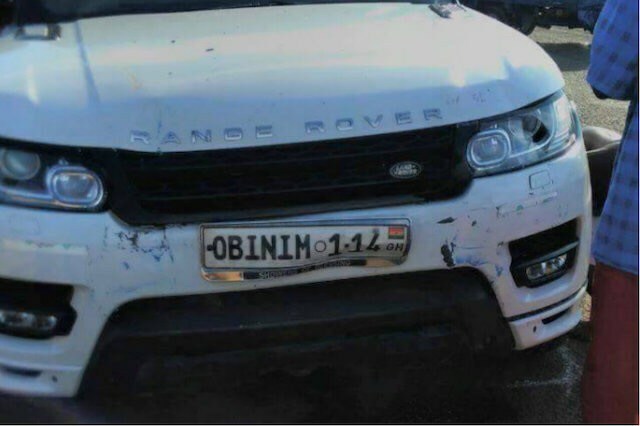 A Range Rover belonging to maverick televangelist Bishop Daniel Obinim was involved in an accident at Ashaley Botwe, a suburb of Accra, Tuesday. Earlier, reports were rife that a yet-to-be identified kid was hit in the process, but StarrFMonline.com’s checks indicate no minor was involved or hurt during the motor crash.The luxurious vehicle with the registration number Obinim 1-14 was being driven by the driver of the controversial pastor when a KIA vehicle rammed into it, the MD of OB TV, Samuel Owusu Asare, who speaks for Obinim told StarrFMonline.com. Asare said the driver had gone to drop the kids of the religious leader and upon his return got crashed into by the KIA truck. “The two drivers are currently being treated at the hospital, having sustained injuries,” Asare stated. Obinim has been in the news lately for claiming he can transform into a snake as part of his gifts from God.